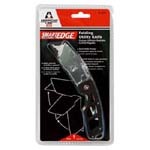 Paint Store :: Shop by Brand :: American Safety Razor :: AMERICAN LINE 65-0200 FOLDING RETRACTABLE UTILITY KNIFE. Folding design for extra safety. Blade extends as knife is opened. retracts as you close. Distinctive cut away handle. Zinc construction.for solid feel. MINWAX 21330 SATIN OLD MAPLE 330 POLYSHADES SIZE:1/2 PINT. SHEFFIELD 1624 #33 AVOCADO TINTS ALL SIZE:1.5 OZ PACK:6 PCS. KRYLON 7340 SPRAY SB HIGHWAY WHITE CONTRACTOR STRIPPING SOLVENT BASED SIZE:15 OZ. SPRAY PACK:6 PCS.